Bushnell E2732 Elite 2-7x32 Riflescope E2732 FREE SHIPPING! The Bushnell Elite 2-7x32 is a compact riflescope built for short to medium range hunting. Its rugged aluminum tube and excellent recoil resistance make it ideal for use with slug guns, and its O-ring seals and argon fill prevent water intrusion and fogging in wet conditions. The Rainguard HD external lens coating breaks up water droplets on the glass, reducing light scattering. The scope features fully multi-coated optics with the advanced Ultra Wide Band Coating to maximize light transmission across a greater range of the visual spectrum, delivering exceptional image brightness and resolution for improved performance in low lighting. The scope comes with the classic Multi-X reticle, as well as precise fingertip-adjustable windage and elevation controls for enhanced shooting precision. 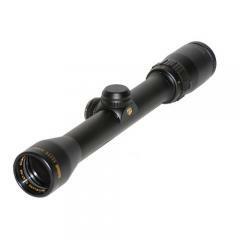 ©2002-2019 CopsPlus.com: Bushnell E2732 Elite 2-7x32 Riflescope E2732 FREE SHIPPING!